Once the structure of processes and their interfaces are clear one should define the approach for ensuring that those processes are running according to expectations (known as "Process Control"). A coherent strategy for process control not only helps to assess whether the objectives followed with the ITIL introduction are achieved, but also has long-term benefits, in that it delivers the necessary data for a continuous process improvement. How to decide whether a process “runs well” or not? Objective criteria (quality measurements, also known as Key Performance Indicators or KPIs) must be determined for this purpose. Only then, when it is clear which quality measurements a process must achieve, can its inner details be confi­dently designed with these goals in mind. Successful management of a process depends on Process Owners who identify themselves closely with their task, and who are sufficiently empowered and equipped with the necessary means. It is therefore important to have the Process Owners (being the ones responsible for running the processes after their implementation) as active participants in the implementation project, so they should be named at an early stage. In most cases, the selection of Process Owners is rather straightforward (the Problem Manager will, for example, be the owner of the Problem Management process). Process Owners use objective quality criteria to assess whether their processes are running "well". This puts them in a position to decide upon the need for process improvements. The first step when selecting suitable ITIL KPIs (see Fig. 1: ITIL metrics - examples) must always be to decide upon the overall objectives of a process, e.g. a high first-resolution rate at the Service Desk. With these objectives in mind, it will be possible to select KPIs which are suitable to measure a successful process execution. There are also quantitative measures, which are used by the Process Owner to steer the resources within a process (e.g. the number of Incidents received by the Service Desk over the course of time). Which KPIs are eventually chosen is dependent, amongst other things, upon the available possibilities for their measurement. Ideally, KPIs can be computed automatically, e. g. via a Service Desk system. The measurement procedures defined here are therefore also requirements for the systems to be implemented. 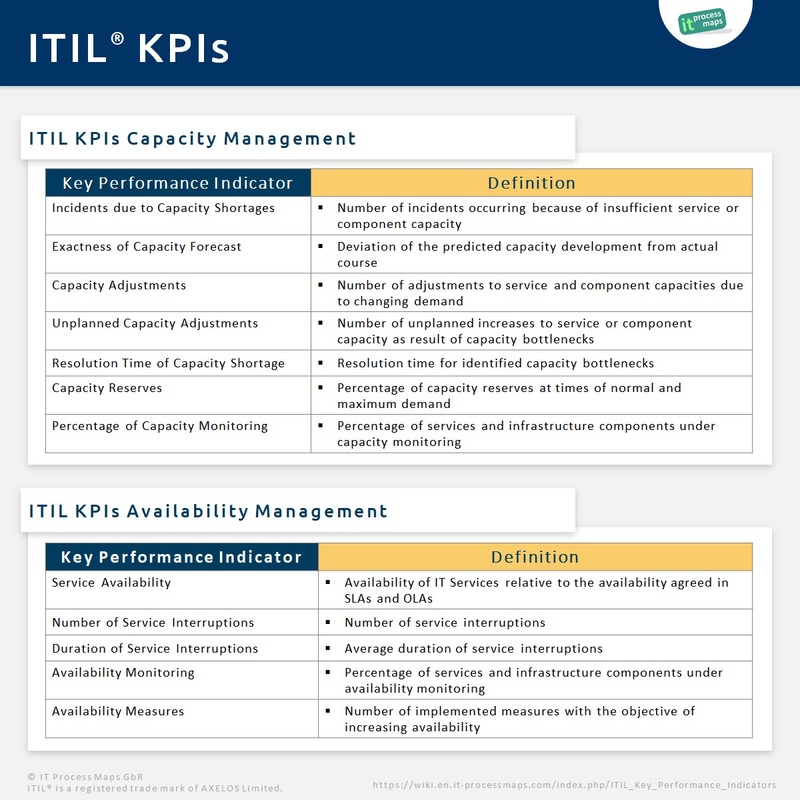 This ITIL Wiki contains a choice of suitable ITIL KPIs. These KPIs were taken from the ITIL recommendations; they have been in some parts supplemented with elements from COBIT. Where necessary, further suggestions for KPIs are available in several books on IT Service Management. Process control should not be about setting up as extensive an arsenal of KPIs as possible: Practice has proven that an over-complex structure of measures creates a disproportionate amount of effort, gains little acceptance, and after a short period, is no longer applied. Rather, few significant measures should be defined so that KPI measurement and reporting may be executed with a justifiable amount of time and effort. Target values for the KPIs define "success" in an objective way and set goals for the Process Owner. It must be noted, however, that target values (like first-time resolution rates) cannot be easily transferred from business to business without precaution. It is recommendable not to define fixed KPI targets initially, but to merely select suitable KPIs and start measuring. Once a statistically significant number of measurement results are present after a certain time there will be a more solid base for setting targets. Reporting on process quality is the final element within process control. Reporting procedures must be defined, specifying which KPIs are reported in which form to particular recipients. IT Management should make a point of the fact that the use of KPIs serves the purpose of improving processes and not the penalization of employees. There might otherwise be the danger of the participants developing strategies in order to tweak the statistics in their favor, which would be against the interests of the IT organization on the whole. Targets for KPIs (especially in the initial phase after the introduction of new processes) are to be reviewed at regular intervals; it is not always necessarily best to strive for top grades – under certain circumstances it is, for example, acceptable to have a lower initial resolution-rate at the Service Desk, if many of the inquiries necessitate specialist knowledge. The ITIL Process Map contains a choice of suitable KPIs for the most important ITIL processes. Additional suggestions for KPIs are available in the ITIL core books and in several other books on IT Service Management. This page was last edited on 29 March 2019, at 18:58.